Metadata is a powerful tool for organizing information resources, and its importance has increased on the Web. In particular, a method of information organization called “social tagging” has spread rapidly on sites like delicious, YouTube, and Twitter. Users of these Web services freely create and manage metadata called “tags” that enable clustering and improved searching of information resources. These metadata are called “free terms”. Free term tagging is very simple and easy to use for the Internet user; but there is also a disadvantage in that the information retrieval recall ratio can be reduced. The recall ratio can be improved by using “controlled terms.” If controlled tags, or terms, were used in Web services, the recall ratio would improve. Including the covo.js library on your Web service makes it easy to utilize thesauri and subject headings. covo.js can be introduced into social tagging or information retrieval services. To try them out you will need to download covo.js and some necessary components, put them on your server, and write some configuration code. Covo.js requires a few components to be installed: jQuery UI and the jQuery Autocomplete plugin. If you want to customize covo.js, please refer to the online documentation. The second reason is that Web service users can embed covo.js in Web browsers using Greasemonkey or Firefox add-ons. Currently, we can use covo.js only if a Web service provider has set it up on the server. There are planned future enhancements of covo.js that will allow users to choose whether they use it or not. In this chapter, we explain data-handling methods for various controlled vocabularies on the Web. Figure 2 provides an overview of the organization of this chapter. In this section we introduce the case of Web NDL Authorities (BETA) as an example. Web NDL Authorities (BETA) has been produced by the National Diet Library of Japan and enables us to use all of NDL’s authority files: personal names, family names, corporate names, geographic names, etc. It accepts SPARQL, one of the RDF query languages, and returns authority data in JSONP format. When Web services are not equipped with Web API, we need to harvest and scrape HTML with certain Web services or server-side programs. This section explains the two cases of the INIS Multilingual Thesaurus and the Wikipedia Thesaurus. The key difference between these two services is that the INIS Multilingual Thesaurus consists of static Web pages, while the result pages of the Wikipedia Thesaurus can vary dynamically based on the user’s query. The INIS Multilingual Thesaurus is a set of subject vocabularies on nuclear science and technology published online in HTML and PDF formats. Now, we need not only to prepare a proxy, as explained above, but also to scrape data from such Web pages. Here, our approach is to use another Web service, ScraperWiki. We simply write some PHP code on “Screen Scraper,” the online editor of ScraperWiki, and then it scrapes only the necessary data from the Web pages and returns them in JSONP. Wikipedia Thesaurus is a product of Special Interest Group on Wikipedia Mining. For this service, one needs to query the database with a HTTP GET request, get the search results in HTML, and scrape them using regular expressions. The following is a sample proxy script for Wikipedia Thesaurus. When controlled vocabularies are not provided in any machine-readable formats, they are challenging to use. Unfortunately, we have not yet met this challenge. If the controlled vocabularies you are interested in are only available offline, you might ask the suppliers to publish their resources online (and implement Web API for their services if possible). The final possibility is digitizing them yourself using a document scanner and OCR technology. For all these patterns, we are required to pay attention to the copyright law on using controlled vocabulary services. Furthermore, two problems should be solved to improve the functionality of covo.js. First, controlled vocabularies have rich structures of links among terms, such as BT (broader terms), RT (related terms), or UF (used for) links, but covo.js does not make good use of this. In the present version of covo.js, each keyword can only be displayed in a linear mode. Second, up to now, our proposed library has only used controlled vocabularies on the Web. It is true that controlled terms can improve the information retrieval recall ratio, but free terms are widely used in actual services, such as metadata used in social tagging or search engine queries (or indexes). Thus, in the future we will include such free terms as well as controlled terms. For this purpose, it is necessary to use a mechanism to implement free terms as a controlled vocabulary. The “trigger word” can be customized; it has been set to “-“(hyphen) in this article. In this article we do not deal with solutions to the same origin policy other than using JSONP. However, we want to note one of them here, Cross Origin Resource Sharing (CORS: http://www.w3.org/TR/cors/). Web browsers that implement XMLHttpRequest (XHR) Level 2 allow cross-domain requests from any client if the Web servers are configured to include `Access-Control-Allow-Origin: *` in the headers of the HTTP responses. Many modern browsers, including Internet Explorer 8+, have been supporting XHR Level 2. Shun Nagaya (haseharu@gmail.com) is a librarian at the Japan Atomic Energy Agency. He edits JAEA Reports and JAEA R&D Review and manages the grants for paper submission and conference presentations. He holds a Bachelor’s degree in Engineering from the University of Electro-Communications and a Master’s degree in Library and Information Science from University of Tsukuba. Yutaka Hayashi (hayashiyutaka@gmail.com) is a research librarian at the National Diet Library, Japan, and is engaged in writing blogs and articles for libraries and library science on the Current Awareness Portal (http://current.ndl.go.jp/). He has a Master’s degree in Mathematics from Nagoya University. He formerly worked at Kyoto University until March 2011. Shuhei Otani (otani0083@gmail.com) is a reference librarian at the University of Ryukyus and is in charge of information literacy. He has a Bachelor’s degree in Korean history from Kyushu University. Nagaya, Hayashi, and Otani are library geeks and formed a group called “li:d tech” in January 2011. Keizo Itabashi is a deputy director of the Intellectual Resources Department of the Japan Atomic Energy Agency. Very nice work!! I will try to develop interface from Tematres vocabulary server. There are more than 100 vocabularies on tematres. I do some test with jquery autocomplete… (http://vocabularyserver.com/tools/autocomplete/) buy I think your script is more configurable and elegant. This seems useful not just for assigning vocab, but for suggesting search terms to searchers, from controlled vocab, in a database that uses it. I think TemaTres is very cool project about controlled vocaburary. Mr. Hayashi (author) wrote news-report about TemaTres published in Current Awareness Portal ( http://current.ndl.go.jp/node/18780 ). Please try covo.js, if you possible ! Thank you for your comments and question ! We hope all data providers provide JSONP form or CORS. Covo.js (ver 0.1) is supporting Web NDL Authorities, and this service provided JSONP data. 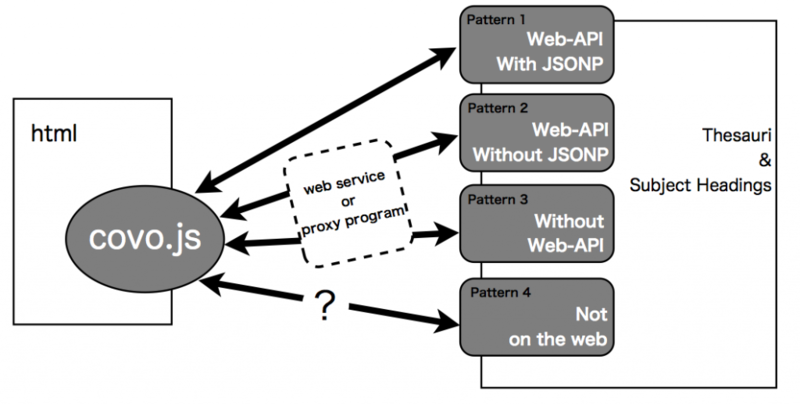 These detail are described at “Pattern 1: Web-API with JSONP”.